Should there still be a SeaWorld? SeaWorld is still drowning in bad PR. Despite launching a marketing blitz aimed at repairing its battered image, SeaWorld (SEAS) suffered another dip in attendance from April to the end of June. Not surprisingly, the theme park's profits are also down -- even more than investors had feared. 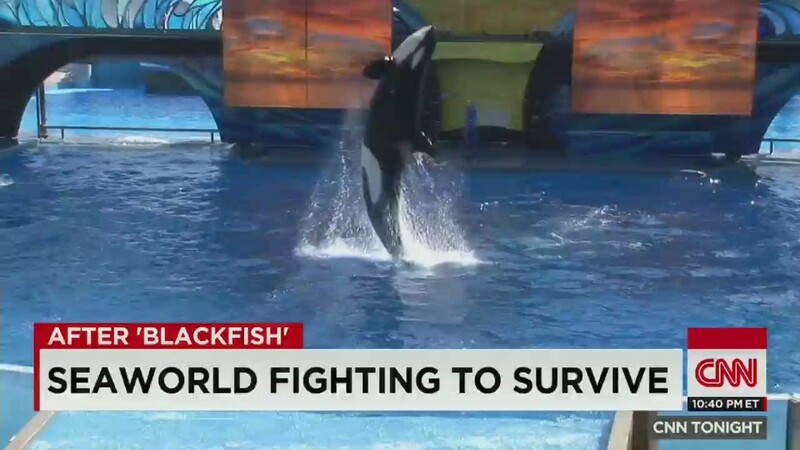 SeaWorld's problems are linked to "Blackfish," the CNN documentary that exposed the alleged dangers and consequences of keeping killer whales in captivity. The critically-acclaimed film was released in 2013 and is now available on Netflix (NFLX). Attendance at SeaWorld's theme parks fell by 2% during the second quarter to 6.5 million. The company blamed the early timing of Easter and "record levels of rainfall in Texas," but even SeaWorld acknowledged the big elephant (whale?) in the room: "continued brand challenges." SeaWorld specifically cited California as the epicenter of its PR problem. That could be code for PETA, the animal-rights group that has targeted SeaWorld for its treatment of killer whales. PETA seized on SeaWorld's latest attendance drop. "Families just don't want to buy tickets to see orcas going insane inside tiny tanks, and SeaWorld's profits, like the orcas, won't recover until the abusement park empties its tanks and builds coastal sanctuaries," the group wrote in a statement. Can SeaWorld make a comeback? SeaWorld has responded by launching its own marketing effort that features orca trainers who say the animals are treated fairly. SeaWorld said early feedback to the ads has been positive. However, the company's #AskSeaWorld campaign on Twitter seemed to backfire earlier this year when more questions came from activists and animal lovers than supporters. "Why are your parking lots bigger than your Orca tanks," several Twitter users asked. SeaWorld CEO Joel Manby acknowledged that "fully resolving our brand challenges in California will require sustained focus and commitment. SeaWorld is not backing down to the animal-rights activists though. Manby said the brand challenges are being created by "misinformation." In addition to ramping up its advertising, SeaWorld is trying to lure customers back with discounts and plans to open two new rollercoasters in 2016. Profits under pressure: SeaWorld said the moves are paying off, noting "improvements in demand" in Florida. However, the comeback efforts are also weighing on SeaWorld's bottom line by creating additional expenses. Profits tumbled to 22 cents per share, badly missing Wall Street's target of 40 cents. Sales also fell a bit more than analysts called for. To offset its sinking results, SeaWorld unveiled plans late last year to cut $50 million in costs and lay off 300 workers. SeaWorld shares initially tumbled before the market opened on Thursday but then reversed course to gain 5%. Despite the rally, SeaWorld shares have lost a third of their value over the past year.